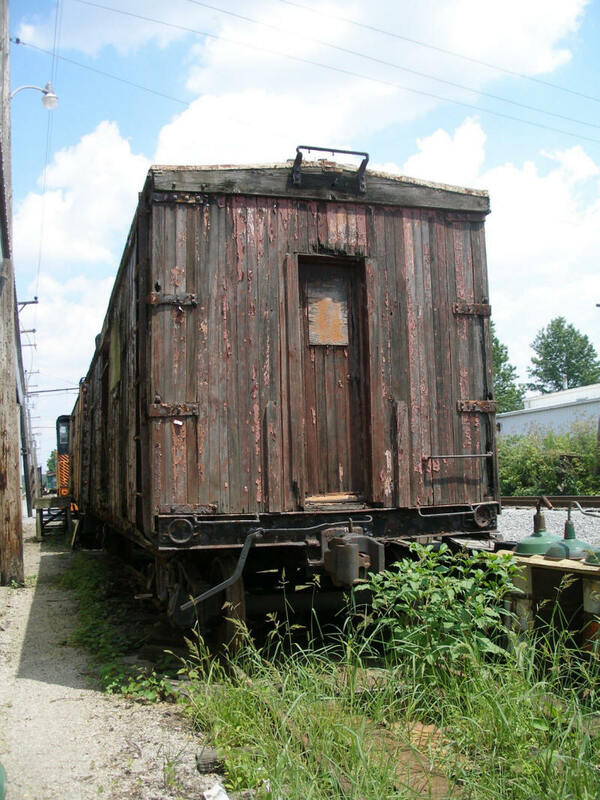 A vintage 1910 pre-USRA box car has been "recycled" three times. 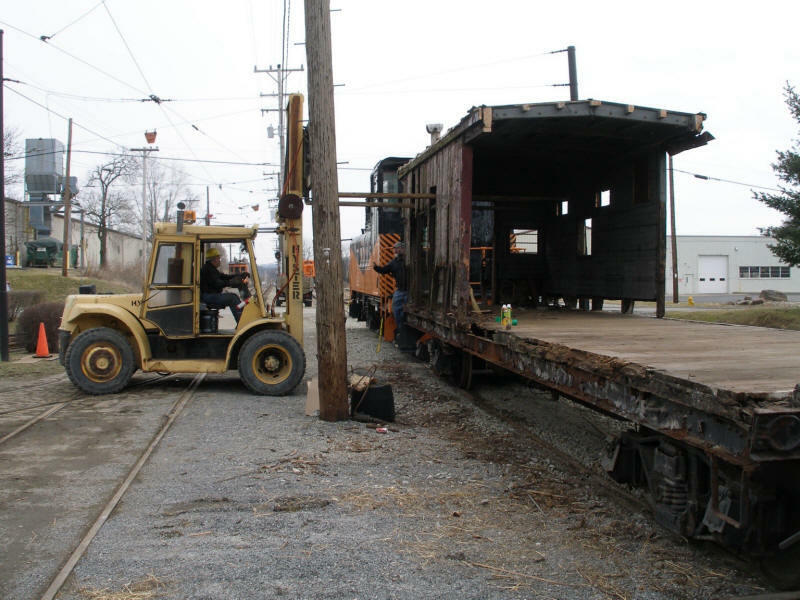 The car was recently donated by the Pennsylvania Trolley Museum (PTM) in Washington, PA to the Maryland & Pennsylvania Railroad Preservation Society (M&PRPS) in Muddy Creek Forks, PA.
Union Railroad 177 started out as URR #10453, built in 1910 by the Pressed Steel Car Co. of McKees Rocks, PA for use in tinplate service. It is considered one of the earliest 50 ton capacity cars still in existence and features a "fish belly" underframe, original Simplex arch bar trucks and sectional steel roof. The car was modified by the railroad with AB brakes and was made into a Union Railroad tool car #177 in 1938. Modifications included attaching a platform with caboose steps on one end and end doors added on both ends. One side box car door was removed and sheathed over so wooden parts bins could be installed full length inside. Its second recycling occurred in August 1963 when the Union Railroad graciously donated this car to the Pennsylvania Trolley Museum (then called the Arden Trolley Museum). 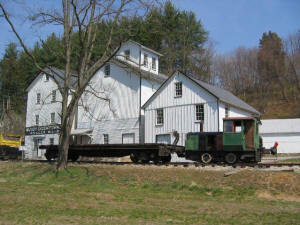 The museum used the car as its original workshop for running repairs on its fleet of trolley cars. 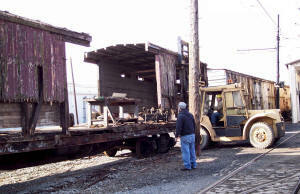 After a shop building was erected in 1975 car 177 was relegated to parts storage. When its exterior sheathing began to deteriorate at a faster pace, the Museum decided to seek a new home for the car about three years ago. 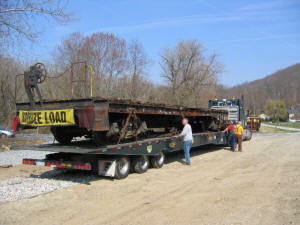 It was willing to donate it to a rail museum but, due to high transportation costs, could find no takers. Exterior sheathing deteriorating rapidly, the PTM decided to offer the car for donation to another museum. Photo by Scott Becker. Late last year PTM decided to offer the car as a flatcar, thinking that with its end steps in place it would make the basis for an ideal "tourist" car. The M&PRPS is preparing to add locomotive-hauled trains to its interpretive experience after TEA-21 funded improvements to its embankments and bridges are complete. This car makes an especially appropriate addition to the M&PRPS roster. Its age fits neatly into the Ma & Pa era; its arch bar trucks are similar to those used on almost all M&P freight cars; and its successive modification from boxcar to tool car to excursion car mirrors M&P practice. In fact, the Ma & Pa operated a flatcar-based excursion car, #110, that was built in 1938 using the trucks and other metal parts from stock car #210, which had in turn been converted from an Atlantic Coast Line boxcar that was wrecked in 1918 on the M&P. March 11th, dismantling of the superstructure begins. Top photo by Scott Becker, lower photo by Jim Herron. In late 2005, PTM volunteers began cleaning all the parts out of the car. Wood salvaged from the tool bins was recycled as trolley boards in its new trolley maintenance shop. The heavy wood work bench was also salvaged to live on at new maintenance shop. Dave Hamley, PTM&apos;s President and overseer of its rubber-tired fleet of work equipment, worked out a plan to cut around the bottom of the boxcar walls and then use PTM&apos;s 10 ton Hyster forklift, uniquely outfitted with 13-foot forks, to lift off the one half of the car&apos;s superstructure at a time. On March 11th a dozen or so PTM volunteers and an M&PRPS representative began the superstructure dismantling process. It was a bright and sunny day and the plan worked very well. By 4:30 both body sections were on the burn pile and the deck was swept off. Metal parts of the car were salvaged to be used by M&PRPS in other restoration projects. Of special interest was an early 20th century smoke jack that will replace the missing smoke jack of Ma & Pa caboose #2003, a 105 year old bobber currently under restoration at Muddy Creek Forks. March 30th, car is loaded onto a roll back truck (above top). March 31st, car is on Ma & Pa trackage ready for service (above). Photos by Craig Sansonetti. On March 30th, a special roll back truck arrived from Silk Road Transport, Inc. to winch the car up on its deck. Friday March 31st found Union RR 177 rolled onto the Ma & Pa&apos;s track ready for its third recycling and service that will continue well into its next century of use!